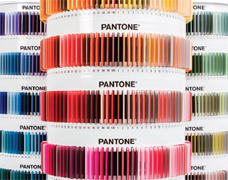 We sat down with Kim to learn more about a new product from Pantone, the Plastic Standard Chips PLUS Collection. The amount of colors available makes it relevant to many industries and offers them variety and options. The large surface area of the chips means easier visualization and evaluation of color, which means better quality control from start to finish. This allows for quicker turn-around times in production and consistency in color reproduction. Chips can be purchased individually for anyone in the development chain, ensuring accurate color when multiple components are part of the production process. Overall, it allows for more effective color communication for anyone in the plastics industry. 1,755 Chips, that is a lot! Was the design of the display just as important as the chips themselves? Yes! When designing the carousel system we wanted to be sure it was modular, so customers could really utilize it to visualize and specify colors. 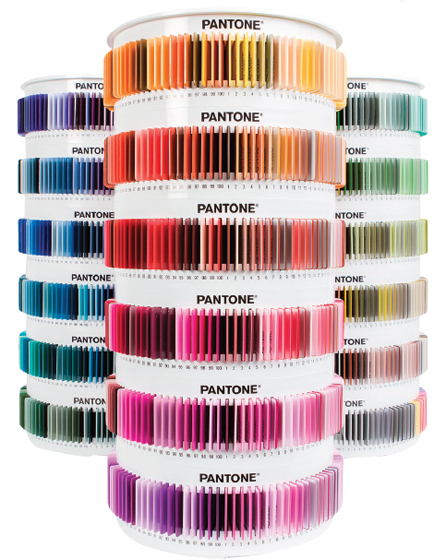 Each tray of the system can be removed so individual color families can be worked with. We wanted to make sure the chips were protected too; with this system they are tucked in so core of chip is not directly exposed to light. How can these be utilized with other types of color matching services and products? What is really cool is that they directly correspond to the PMS system. That means anyone who is doing multiple product coordination can specify the same color number in multiple substrates. For example, if you need packaging in paper for your plastic product, you could have a standard to use across the board. Who should be thinking about getting these chips? When we were developing the product, we made sure to really listen to a broad spectrum of people in plastic industries to develop a system that could truly help them be more effective. We saw our customers buying products that were not exactly right for their market and knew it didn’t give them what they needed. They were creating their own work flow based on what was available. We strove to produce a system that was fluid and could work for various needs. So really, this is a product for anyone who creates products in plastic: accessories, consumer products, home products, electronics, toys – if it involves plastics, even in combination with other materials, you name it, this product can help. Why is accurate color reproduction so important in the plastics industry? It is often the case in the plastics industry that large batches are created because one-offs are not cost effective. There can be huge monetary and time loss when a color is not correct. In addition, being able to accurately communicate color means a better work flow in the manufacturing process – definitely better than spending time having to go back and forth to getting the color right. These can be utilized through the development process, can you talk about why that is so important? You get a full set of colors which means at the start, you can get inspired to create your palette just by looking at the carousels – a spin is all it takes. The colors can be shared with customers to get their feedback and input, or shared with other individuals in the manufacturing process. It gives us the ability to get everyone involved in the color development process. Let’s talk money, what kind of cost savings are we looking at? It can be huge. Going to market with a product that is in the wrong color, off trend or that doesn’t match other materials within an assortment could be devastating for a company. It would lead to markdowns and excessive inventory rather than sales. What industries have you seen the largest interest from for the Plastic standards? So many, it’s been across the board. Lately we have seen many inquires in home accessories – plastic utensils, plates, etc. and consumer electronics. Are different Resin types available? We chose polypropylene as a standard, facilitating matching of any other plastic resin. This was based on customer feedback and the popularity of it in the market. However, if you need a custom color or resin we have the ability to create it. It would be a different process on our end but could be a great investment for a company. What if you need a color that is not part of the 1,755? We can make any color or color groupings imaginable. Our off the shelf Plastic Standard Chips can be purchased in any of our Graphics or Fashion + Home Libraries. What is the end result for the consumer? Being able to have a visual standard in the substrate closest to what they are making. This bring color matching and communication to life more than ever before when the color was replicated on paper or something other than plastic. Our system, our library of colors, is always reproducible and on trend. You are getting color from the experts in color. Any similar products available in other surfaces? 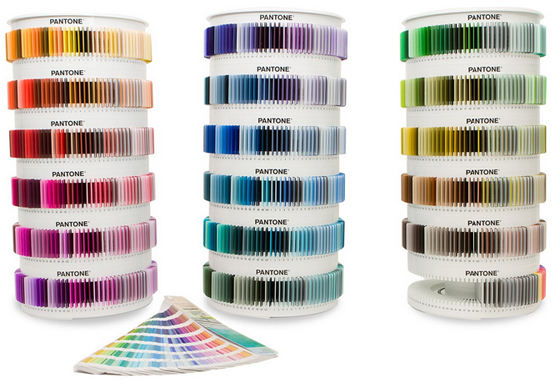 We have 2,100 colors in cotton. These are perfect for people in the fashion and design world. Oh, and those colors are available in plastic too.